The Wey Navigation is Surrey's oldest waterway, with an interactive visitor centre at Dapdune Wharf. 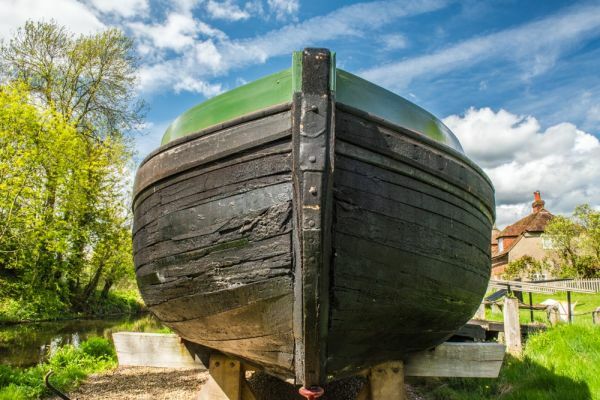 Visitors can climb aboard an original Wey barge, and visit a smithy, stable, and barge-building shed in the largest building site on the 20 mile long Wey Navigation. The Wey Navigations were one of the earliest canal projects in Britain. The first canal was begun in 1635 by Sir Richard Weston and helped link Guildford to the River Thames and on to London. The Navigation was a combination of man-made canals and dredged sections of the naturally shallow River Wey. The first section of the canal, from Guildford to Weybridge, opened in 1653, with a series of 12 locks. The route was first used to transport goods such as gunpowder, corn, wood, and flour to London, and to bring back coal for manufacturing gunpowder. In 1760 the canal network was extended another 4 miles to Godalming, with 4 locks dealing with elevation changes. The route was later linked to the Basingstoke Canal and to the Wey and Arun Junction Canal when it opened in 1813. 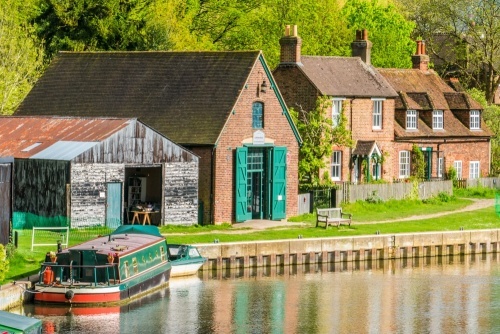 The Dapdune Wharf at Guildford was a centre for boat repair and was subsequently converted by the National Trust to a visitor centre and museum covering the long history of the waterway. For much of the 20th century, the canal was privately owned by the Stevens family. In 1964 it was given to the National Trust, but commercial traffic on the canal continued until 1983. 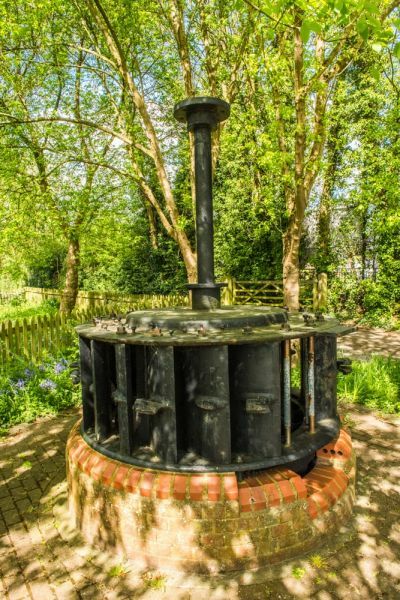 The visitor centre has exhibits on the history of the Wey Navigation. You can see where the massive Wey barges were constructed, and explore two of the only 3 remaining Wey barges in existence. A barge named Reliance is in permanent dry dock, and can be explored by visitors, while the other, dubbed Perseverance, is moored in the water and awaits restoration. The Reliance has had a hard life; she was built in 1932 and worked carrying goods between Guildford and London docks until 1968 when she ran into Canon Street Bridge in London and sank. The boat was abandoned and only discovered 21 years later at Leigh-on-Sea in Essex. 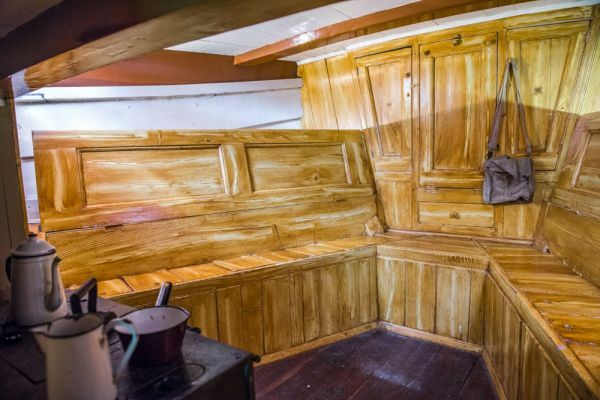 The restoration took 6 months, but now the Reliance is back at Dapdune and gives visitors a glimpse into what life was like on the canal in the early and mid 20th century. The visitor centre tells the story of the people who built the boats, kept the locks, and used the Navigation to send and receive goods. Visitors can take hire boats to explore the Navigation or enjoy a 40-minute boat trip on an electric barge. The canal towpath is a popular walking route and connects to two national trails; the North Downs Way and the Thames Path. You can walk the entire length of the Navigation, and explore any part of it, as the entire route is easily accessible and free to enjoy. At the northern end of the route is Thames Lock at Weybridge, where the Wey empties into the Thames. The Navigation is divided into 6 'lengths', or short sections, maintained by lengthsmen. The towpath is 20 miles long from Godalming to Weybridge, and most of that length passes through idyllic countryside. 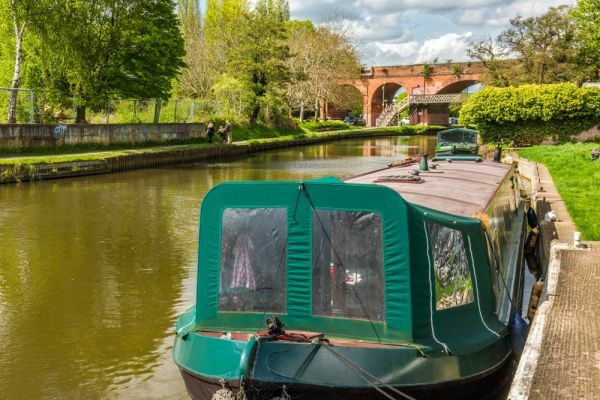 If you prefer not to explore the towpath on your own you can join one of the regular walking tours organised by the National Trust. Though the Dapdune Wharf property is not large, it packs a lot to see into a small area. There is an introduction to the Wharf in a small stable building, once used for the horses that pulled barges along the Navigation. There were originally more stables for housing the smaller carthorses used for local deliveries. 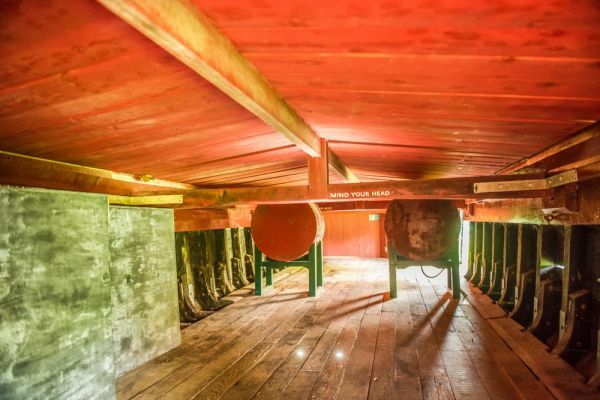 The stables were later converted to hold the boiler for a steam chest used to heat wooden planks so they would become pliable and could be bent to the correct curvature for barge-building. You can see a steam chest behind the stable. Joined to the stable is a smithy, whee a blacksmith used a bellows-driven forge to make iron implements. This building was once used as a nail store. Beside the smithy is a tar chest, where tar was combined with fibre such as goat hair or hemp. This coarse mixture could then be used to plug holes in a barge's planks,making it watertight. Caulking a barge with this tarry mixture was an exacting process, for the tar had to be heated to a very precise temperature so it could achieve just the right consistency. Built over the end of a backwater channel is the shed where barges could be repaired. This shed now provides a sheltered mooring place for the electric boat used to provide boat trips to visitors. If barges needed to be repaired below the waterline they were hauled up onto the bank. Next to the Barge Repair Shed is the Reliance, an original Wey barge whose history is outlined above. You can go inside the vessel, though be careful not to hit your head, as the height between the deck and barge hull is not exactly spacious. You can see where cargo was stored and take a peak into the crew's quarters at the bow of the boat. This area has some very basic creature comforts; little more than benches and a stove. Beside the Reliance are the capstans used to drag barges onto the shore, a proces that usualy took four strong men. Beyond the Reliance and Barge Repair Shed is Dapdune Island, which is not really an island but an area of dry land bordered by the Wey on two sides and the boat repair channel on a third side. The 'island' is maintained as a wildlife reserve and a place for visitors to enjoy a picnic. Set back from the river is a row of cottages. 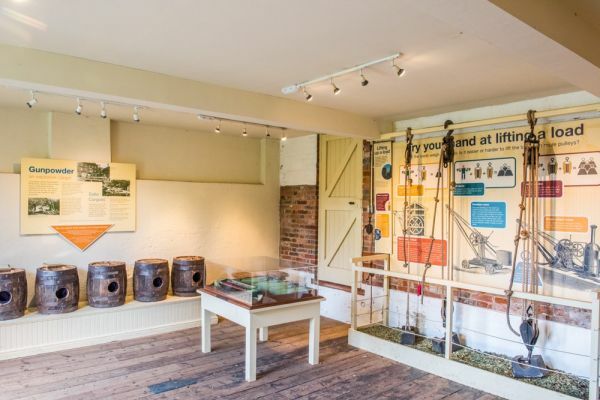 The first of these is the Gunpowder Store, where you can lear more about the Wey Navigation, see how pulleys work, and try your hand at typing nautical knots (it's harder than it looks!). The Gunpowder Stores form part of the oldest building at Dapdune Wharf, built in the middle of the 17th century to store gunpowder, as its name suggests. It was later used to store ropes and sheets, and to mix paint. Beside the Gunpowder Store is Wharf Cottage, built in 1894 for the Edwards family, who came to Dapdune to repair barges after fulfilling the same role on the Kennet and Avon Canal. In modern parlance the Edwards family were 'headhunted' by the Stevens family, owners of the Wey Navigation, because they were considered the best barge repairers available. This property is now a private dwelling. 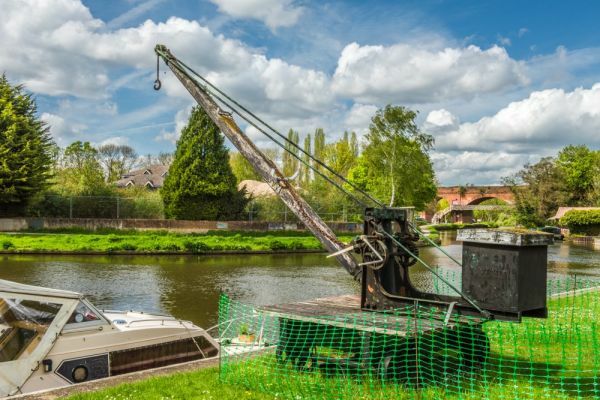 Opposite the two cottages is a large crane, installed around 1935 to unload carbide, From the crane you can see the Perseverance IV moored off Dapdune Island, another traditional barge that awaits restoration. Beyond the crane is the Carbide Store, built in 1916. Carbide shipped from London was stored here, later to be used for early forms of electric lighting. Near the northern end of the Wharf is the shed where barges were constructed. This is now used for visitor workshops and temporary exhibitions. Near the visitor car park entrance is this attractive Victorian house, built in 1894 for the Stevens family. A later Stevens owner installed a balcony so he could watch cricket matches at the neighbouring Surrey Cricket Club ground. Since 1964 it has served as the National Trust office for managing the Wey Navigation waterway. Dapdune Wharf is located just north of Guildford town centre. There is limited signage until you are very close to the site. There is a small parking area at the Wharf as well as a National Trust information point, teashop and picnic tables. We arrived by car, but I frankly would not advise it. Guildford suffers from horrendous traffic congestion, and you can find yourself inching along through the town centre. I struck up a conversation with a National Trust volunteer who lives locally told me that she simply refuses to drive during rush hour. A much better option is to use the Guildford park and ride service. 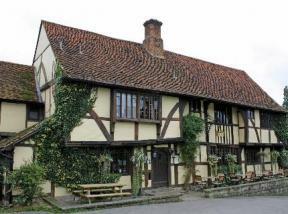 Dapdune Wharf is a 15-20 minute stroll from Guldford Castle and historic core of town. 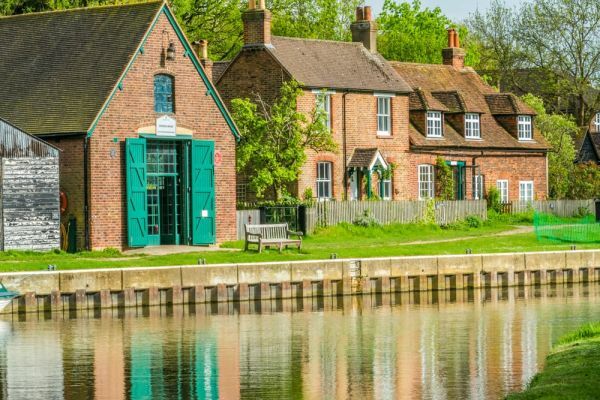 Aside from exploring the restored canal barge Reliant and the array of historic buildings related to boat repair, the highlight of a visit to Dapdune Wharf is the chance to take a boat trip along the Wey Navigation. 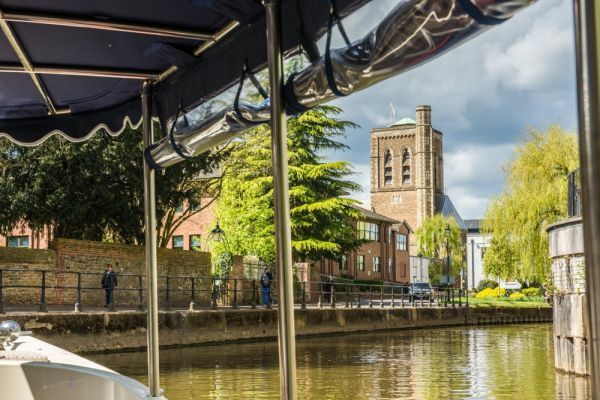 There is a very reasonable charge for the boat trip, which takes you around Dapdune Island, past the Perserverance, and through the historic centre of Guildford along the River Wey. Our National Trust volunteer guide was extremely entertaining, and regaled us with history of the Navigation, and of Guildford itself. We learned how the town grey up around a 'golden ford' across the River Wey, so named because of the golden colour of the sand that lind the riverbank. We saw old warehouses lining the river, most of which have been restored and converted to other purposes. It was an extremely enjoyable, slow-paced experience, ad I highly recommend taking a boat trip if you have the time.